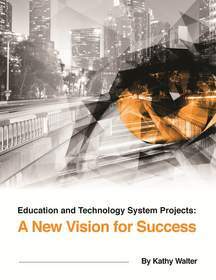 Nsoma Announces Kathy Walter's New eBook "Education and Technology System Projects: A New Vision for Success"
NEW YORK, NY--(Marketwired - Mar 25, 2015) - Nsoma announces Kathy Walter's latest publication, "Education and Technology System Projects: A New Vision for Success," available on Kindle. The book contains innovative solutions to support the instructional and educational agendas of school districts, universities and edTech companies. Ms. Walter, CEO of Nsoma, recently served as the Executive Director, Product Strategy & Innovation at the NYC Department of Education and as Business Consultant for Macmillan New Ventures. She started her career managing IT projects as a COBOL programmer and project manager. She also has a decade of product management and development experience at large corporations including Instinet, Gillette, Proctor & Gamble and Iron Mountain. Ms. Walter has a BS in Applied Math from Union College, an MBA from NYU Stern, and a Graduate Certificate in TESOL. She has been an ESL Educator at Northeastern University and Cambridge Learning Center; an ESL curriculum consultant with the YearUp program in Boston; and a program developer for several teaching projects in Uganda. The book has something for everyone with an interest in technology and/or building educational systems. It helps with everything from customer support to operations and training. "Education Technology projects in K12 and Higher Ed are rife with big dollars and under delivery and it's no wonder," says Kathy Walter, CEO of Nsoma. "You have program and curriculum leaders who are in their positions because of their education backgrounds and technology leaders who are in their positions because of their technology backgrounds. Two very different skill sets all with the best of intentions." The book takes two decades worth of technology, business and education experience and provides a practical set of steps for educational organizations. You will see checklists and rules to live by, but the book also takes a unique approach to the problem. "If you want to get people together who do not understand each other, don't sweep the differences under the rug," says Ms. Walter. "Instead...celebrate them! Each group brings valuable experience to the table -- it's important to understand what those differences are and how they can be best utilized for a successful project." The book is divided into sections -- each of which can be read by one group or the other. For instance, if you are more knowledgeable about the program needs, you read about the technology details on projects and vice versa. There are also sections on areas that often do not get talked about -- until it's too late, like customer support, help desks, operations and training. For further information about the book, Nsoma and our solutions, contact Kathy Walter, CEO, Nsoma, 877-300-6215 and/or www.nsoma.com.